Morocco launched on Wednesday its second earth observation satellite (Mohammed VI-B), a technological breakthrough, which will enable the North African Kingdom to boost its agricultural sector, improve its water management, forestry and town planning. 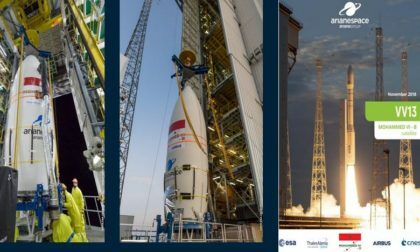 Like the first Mohammed VI-A satellite, put into orbit on November 8, 2017, the second spacecraft, baptized the MOHAMMED VI-B satellite was also orbited from the Kourou launch site, in French Guyana by Arianspace. The two earth observation satellites were developed by a consortium comprising Thales Alenia Space as system prime contractor and Airbus as co-prime. The two satellites will be operated by Moroccan engineers and technicians. They can take very high resolution images, which are very important for Moroccan decision-makers and agronomists as the sector of agriculture in the country contributes about 20 pc to the national GDP and employs over 4 million people including about 100,000 in agro-industry. Agriculture also plays a key role in Morocco’s macroeconomic balances. It supports the income of 80 pc of the 14 million rural people and these people will get a huge boost thanks to the precise data to be provided by the Mohammed VI A & B satellites, which will work in complementarity. According to some experts, the use of space technology will enable Moroccans to improve the management of agricultural resources for a better planning and implementation of tailored farming strategies. The deployment of the two satellites offers operators in the field of agriculture (public, governmental departments, agribusinesses, cooperatives, farmers) the possibility to have access to dynamic mapping of land use, monitoring crop status, farming cycle and cereal production forecasting. Combined with auxiliary data, the imagery to be provided by the satellites offers policy makers and managers accurate and useful information for agricultural development at the local, regional and national levels. To boost the production of agriculture, depending more and more on irrigation, Morocco needs to monitor the consumption of water by crops using remote sensing technology, which can help in the hydrological assessment for best water management in agriculture. The space data will also enable Moroccan decision-makers measure the impact of the expansion of urbanism projects on agricultural lands, carry out forest inventories, evaluate pastoral resources and better manage forest activities. The two Moroccan satellites will also be used for monitoring changes in the environment and desertification as well as for border and coastal surveillance.